Research– Be sure to go online and check review sites. Ask family and friends about their past experiences. Use social media to get recommendations from others. You could even check their standing with the Better Business Bureau. It’s important to put a little extra work in on the front end so that you can make a smart decision. Get Multiple Quotes– Call a variety of moving companies and see what their hourly prices are and what it includes. Sometimes companies will have little extras that they offer (free boxes, discount on packing services, etc.). This could make a difference to you beyond just the hourly rate. Let’s just say that cheaper is not necessarily better! Review the Contract and Ask Questions– Once you’ve selected your mover and are ready to make it official, be sure that the rates and dates listed on the contract match what you were quoted. Check for liability information. Are there any hidden fees? Most importantly, keep a signed copy of the contract until after the move and when you’ve finished unpacking. It’s better to be safe than sorry! Moving can be overwhelming and is generally something that everybody dreads. It doesn’t have to be that way though! We would be glad to help point you in the right direction! 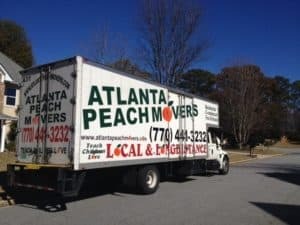 We have a wonderful list of vendors on our website, including Metro Atlanta movers (https://www.thepeterscompany.com/vendors/). If you aren’t quite ready to hire the movers and want to explore buying or selling in Atlanta, give The Peters Company a call! We’d love to help get you MOVING! 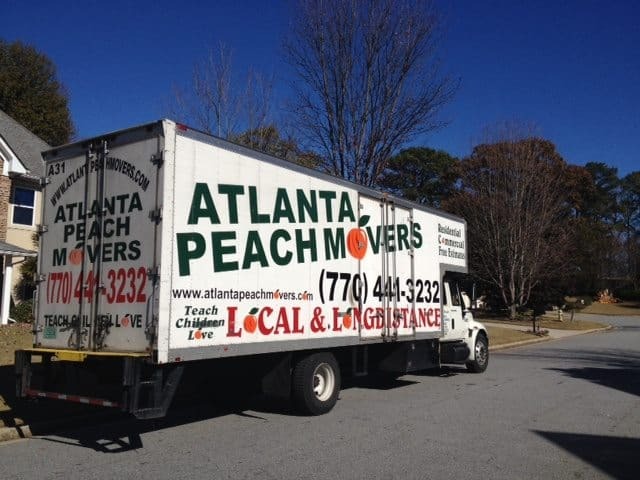 *Photo of Atlanta Peach Movers moving Andy and Lesley last year!